The Holiday Season is upon us! To celebrate, I'll be having a giveaway series featuring some of my favorite products for you to win. Each day for the next twelve days, I'll feature a giveaway item that one random winner will receive. The rules are simple...just answer the day's question and leave your eMail in the comments (or check back to see if you've won if you don't feel comfortable leaving your address. You can then eMail me at mej0620@hotmail.com). U.S. residents only, Followers only (includes Google Friend Connect, subscribers, social media followers). 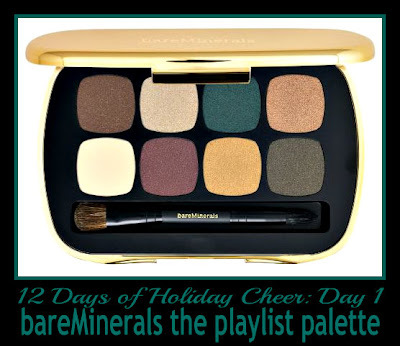 Today's prize is the bareMinerals eye shadow palette The Playlist. This palette was my gateway into the addicting world of bareMinerals, so it has a special meaning to me. Yes, I'm sentimental about my cosmetics! Yours will be new of course, and it's packaged in a beautiful shiny gold palette and boxed. It's a lovely range of shades, and if you're familiar with bareMinerals, you already know how soft, buttery, and blendable their eye shadows are. 12 Days of Holiday Cheer Day 1 Question: Do you prefer a white or green Christmas/Holiday, and why? My answer: White, all the way! We usually have a white Christmas, and it just seems more festive and beautiful that way. Besides, it makes it easier for the reindeer to land on the roof! I'll confess though, that the snow can all disappear after December 31, although that never seems to happen where I live! Oh this is a brilliant idea! Really generous of you. Pity I'm not living in the U.S. I'd much prefer a white Christmas! I love playing in the snow with my family. I won't be home for Christmas this year, but I always love snow! And my e-mail is l y n n 1 5 5 1 at yahoo.com. Green all the way :) California girl!! Definitely a white Christmas. In my mind it just make sense.I'm from the Northeast and almost every Christmas movie I grew up with depicts a white Christmas. Gotta have a white Holiday Season. I wish I still lived in Buffalo where it more likely to happen. I prefer the green christmas, born and raised in socal, I wouldn't be able to survive in the snow! I love a white Christmas! I live in Chicago and that is the only time I want to see snow, unfortunately I usually get more than that. Definitely a GREEN Christmas. I work for State Road Maintenance. If it snows on Christmas I will be working!! I'm with you! I prefer a white Christmas with lots of hot cocoa!! Green. I think the snow makes it feel more christmasy but i absolutely hate it! I prefer a green Christmas because I'm usually the one that has to shovel the driveway and sidewalk when it snows. I'd love to have a white Christmas! I prefer a White Christmas but being in the state of WA it's usually green. Happy Holidays, Mary! Thanks for the awesome giveaway! I definitely prefer a white Christmas, but the snow can GTHO right after the first of the year. I don't think we'll have a white Christmas in KC this year (we haven't had one for a few years), since it was 74 degrees yesterday and it's in the 60s today. I'd love to have a white Christmas! it's so beautiful and we've never had one before!!! I love a white Christmas, as long as I don't have to travel anywhere. It's so beautiful. I live in NH so we always have a good chance at a white Christmas. I prefer a white Christmas because it rarely happens here and it is beautiful to see when it does happen. White! I absolutely love snow. I love a white Christmas. There is a hush that comes over everything when it snows that is comforting to me. It makes everything so beautiful and just seems appropriate for the holiday. I'm all for the traditional Christmas so white snowy christmas all the way! It makes everything just so much more crisp and stunning. Green!! I get cold easily...lol. I do like the way a white Christmas looks though, but we don't have too many of those in SoCal or South Texas. A white Christmas. It doesn't feel like Christmas without snow. The spirit of the holidays are there, but it feels like something is missing without snow.